Slip decoration on pottery is a very old technique. In the Mediterranean and Near Eastern ceramic tradition it goes back to at least 2,000 BC. Slip decoration involves applying a trail of thick, wet clay to the surface of a pottery vessel prior to it being fired. The slip may be in a contrasting color to the body of the vessel, and more than one color of slip may be applied. The still slightly fluid slip may then be trailed or combed with hand tools, creating feathering, or moved from side to side, allowing gravity to form patterns resembling marbling. Once fired, the result is a pot, plate or other object that features bold and colorful decoration as well as texture. Slip may be applied in a number of different ways, including the use of a large syringe, a pastry bag with a fine tip, a balloon shaped applicator to which various sized nozzles may be affixed or even a squeeze bottle like those used for ketchup or hot sauce. Whatever the tool, the basic technique hasn’t changed much in many centuries. I’ve long been fascinated with a variety of slip decorating techniques used extensively in England from about the mid-1600s through mid-1800s. The wares on which these techniques were used contrast strongly with the emergence at around the same period of imported porcelains from China and Japan, soft paste porcelain and other high fired, hard bodies ceramics such as stonewares made in Europe, and new decorative techniques, including enamel painting and image transfers. The earthenwares on which slip decorating was practiced were marketed to and used by the lower and middle classes of society in England. Their bold styles hold much appeal to modern studio potters, artists and collectors. 18th Century English slip decorated earthenware platter with thick trails of slip in straight and squiggly lines. Late 18th Century English slip decorated earthenware platter on which thick trails of slip have been dragged with a fine tool, creating a feathered effect. While slip trailed pottery of this period may have been used in a more humble setting than imported and domestic porcelains, at it’s best it could be visually stunning. In my own ceramic work I have tried not only to loosely reproduce some of these decorative techniques but also to reinterpret them, as have other modern studio potters in England, the U.S. and elsewhere. Even in Colonial North America and for decades after American independence, potters from as far north as Maine and as far south as North Carolina adapted the slip trailing techniques to their own wares, usually made with red bodied clays. Redware pottery plate from Quakertown, Pennsylvania, first half of the 19th Century, with extensive use of applied slip trails. The famous British potter Bernard Leach, who helped launch the modern studio pottery tradition in both the U.K. and U.S., often turned to the old, traditional English pottery making techniques before delving into the world of Japanese style pottery. Many other English studio potters to this day utilize traditional slip decoration, often on pottery forms that also look back to the late Medieval and post-Medieval periods. Ceramic charger with slip decoration by Bernard Leach, 1929. In my own attempts at emulating or reinterpreting the best of English 18th Century slip decorated wares I’ve tried a number of techniques. 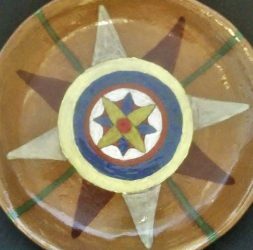 For the simple hand built plate shown below, I recreated as closely as possible the colors used in a couple of different but contemporaneous 18th Century platters with combed slip decoration. But instead of combing or feathering, I applied the slips using a thick paint brush while they were in a watery consistency. Working quickly so as not to allow the slips to dry, I then used a ceramics needle tool to drag small areas of one slip into the adjacent color, creating something like a marbling effect. By contrast, in this similar hand built plate, I applied the slips with a thick brush, then dragged a common toothed sculpting tool, the type used in both ceramic sculpture and wax modeling, across the surface, allowing some overlapping and blending of the sharply contrasting colors. While not resembling closely anything I’ve seen in 18th or 19th Century English slip wares, it did prove to be a bold and satisfying design. Finally, here’s a big stoneware charger I made by pressing a very thin slab of clay into a mold and applying all the slip decoration before firing. 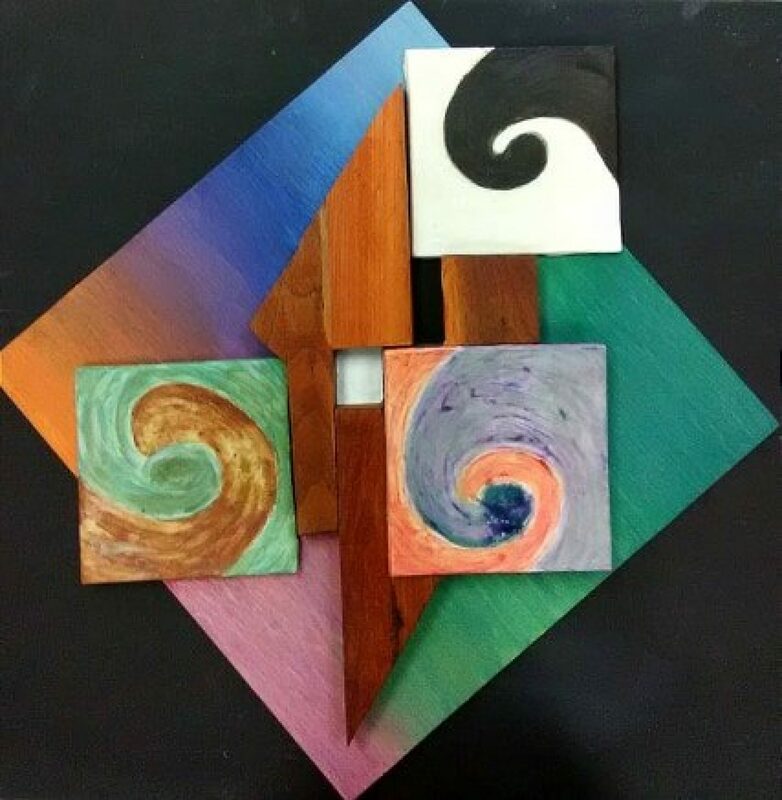 In this case, I started not so much with trails of colored slip as with spills of it, then wobbled the charger from side to side, allowing the colors to blend, overlap and create organic, fluid forms. While original English examples would have only allowed a more formal design, with less blending of colors, in both my example and the originals the effect is somewhat akin to psychedelic art of the 1960s. In future entries I hope to explore the relationships between other media I work in and the same media as expressed in ancient and medieval art.